jVasculitis Clinic (C.P. ), Division of Rheumatology, Mount Sinai Hospital, Toronto, Ontario, Canada. BACKGROUND AND PURPOSE: 3D-TOF-MRA and DSA are 2 available tools to demonstrate neurovascular involvement in primary central nervous system vasculitis. We aimed to compare the diagnostic concordance of vessel imaging using 3D-TOF-MRA and DSA in patients with primary central nervous system vasculitis. MATERIALS AND METHODS: We retrospectively identified all patients included in the French primary central nervous system vasculitis cohort of 85 patients who underwent, at baseline, both intracranial 3D-TOF-MRA and DSA in an interval of no more than 2 weeks and before treatment initiation. Two neuroradiologists independently reviewed all 3D-TOF-MRA and DSA imaging. Brain vasculature was divided into 25 arterial segments. Concordance between 3D-TOF-MRA and DSA for the identification of arterial stenosis was assessed by the Cohen κ Index. RESULTS: Thirty-one patients met the inclusion criteria, including 20 imaged with a 1.5T MR unit and 11 with a 3T MR unit. Among the 25 patients (81%) with abnormal DSA findings, 24 demonstrated abnormal 3D-TOF-MRA findings, whereas all 6 remaining patients with normal DSA findings had normal 3D-TOF-MRA findings. In the per-segment analysis, concordance between 1.5T 3D-TOF-MRA and DSA was 0.82 (95% CI, 0.75–0.93), and between 3T 3D-TOF-MRA and DSA, it was 0.87 (95% CI, 0.78–0.91). CONCLUSIONS: 3D-TOF-MRA shows a high concordance with DSA in diagnostic performance when analyzing brain vasculature in patients with primary central nervous system vasculitis. In patients with negative 3T 3D-TOF-MRA findings, the added diagnostic value of DSA is limited. With the development and gradual improvement of MR imaging technologies, alternative options to image CNS vessels have become available and may be substitutes for DSA. MR imaging is now considered a requirement in all patients with a suspected diagnosis of PCNSV. Noncontrast 3D-TOF-MRA sequences can demonstrate vascular changes, such as stenosis, occlusions, or fusiform dilation. However, in many patients, DSA is still performed, even if the brain 3D-TOF-MRA shows vascular abnormalities. Our aim was to compare the diagnostic concordance between noncontrast intracranial 3D-TOF-MRA and DSA in patients with PCNSV. This study was conducted in accordance with Good Clinical Practices and the Declaration of Helsinki. Inclusion in the cohort required patient informed consent, and the cohort was approved by the Paris-Cochin institutional review board (No. 12541). The article was prepared in accordance with Strengthening the Reporting of Observational Studies in Epidemiology8 and Standards for Reporting of Diagnostic Accuracy Studies (http://www.stard-statement.org/) guidelines. We created a cohort of patients with definite diagnoses of PCNSV (COhort of patients with primary VAsculitis of the Central Nervous System [COVAC]) in 2010 in France using the well-established networks of the French Vasculitis Study Group, French NeuroVascular Society, and National Society of Internal Medicine. This cohort was supported by an institutional grant from the French Ministry of Health (COVAC, 2009 hospital project of clinical research [PHRC] 08017). After the initial description of the first 52 enrolled patients,9 the cohort increased to 85 patients at the time of the present study. As previously mentioned, patients were older than 18 years of age at diagnosis and had evidence of cerebral vascular involvement on brain biopsy and/or CNS vessel imaging. They had all been followed up for at least 6 months after diagnosis (unless they died) and were thoroughly screened at the onset for any differential diagnosis. We excluded patients with other vasculopathies or conditions potentially associated with secondary CNS vasculitis (eg, systemic vasculitis, autoimmune disease, infection). RCVS was excluded for each patient on the basis of the following criteria: 1) clinical presentation (no severe or thunderclap headaches at presentation, unless a brain biopsy showed vasculitis), 2) persistence of some vascular lesions as defined on MRA performed >6 months after the initial diagnostic work-up, and 3) clinical follow-up. For the present study, we retrospectively selected in the COVAC population patients who underwent baseline intracranial 3D-TOF-MRA and DSA before treatment initiation and within a 2-week interval. We did not include patients with both procedures having negative findings and negative or absent biopsy findings. For each patient, all imaging examinations, including source images, were gathered in a digital anonymous format and forwarded for review by 2 neuroradiologists (with 14 [O.N.] and 6 [G.B.] years of experience in stroke imaging) who were blinded to clinical manifestations. Characteristics of each MR imaging unit were also collected. Proximal, second divisions, and subsequent branches of each cerebral artery and the vertebral artery, PICA, anterior inferior cerebellar artery, superior cerebellar artery (SCA), and basilar artery were analyzed with both procedures. For DSA and 3D-TOF-MRA analysis, in line with previous works, we differentiated large-, medium-, and small-sized vessels.11,12 Intracranial internal carotid and proximal anterior (A1), middle (M1), and posterior (P1) cerebral arteries were considered large; second divisions (A2, M2, P2) and subsequent branches (>A2, >M2, >P2) were considered medium- and small-sized vessels, respectively. The vertebral and basilar arteries were considered large-sized vessels, whereas the PICA, anterior inferior cerebellar artery, and SCA were considered medium-sized vessels. We thus divided cerebral vasculature into 25 segments (left and right intracranial internal carotid arteries, A1, A2, >A2, M1, M2, >M2, P1, P2, >P2; vertebral artery; and PICA/anterior inferior cerebellar artery/SCA, and basilar artery). A vascular segment was considered involved in case of stenosis, fusiform dilation, or occlusion. We thus analyzed concordance of 1.5T/3T 3D-TOF-MRA and DSA. Categoric variables are expressed as number (%), and quantitative variables, as median (range). Categoric variables were analyzed with the χ2 test, and quantitative variables were analyzed with the Wilcoxon rank sum test. The Cohen κ Concordance Index was used to analyze concordance between 3D-TOF-MRA and DSA in the global cerebral vasculature and in each vascular territory. Interrater agreement in identifying intracranial artery stenosis on DSA and 3D-TOF-MRA was studied with the Cohen κ Concordance Index. Any discordance between readers was adjudicated by consensus. The index values represent the following interpretations: poor (κ < 0), slight (κ = 0–0.20), fair (κ = 0.21–0.40), moderate (κ = 0.41–0.60), substantial (κ = 0.61–0.80), and almost perfect (κ = 0.81–1). Using DSA as a criterion standard, we calculated the sensitivity, specificity, accuracy, and positive and negative predictive values of MRA on per-patient and per-segment analyses. Statistical analyses were computed with JMP, Version 9.0.1, 2010 (SAS Institute, Cary, North Carolina), with P < .05 defining statistical significance. Among the 85 patients included in COVAC, 31 (from 12 different centers) met the inclusion criteria and underwent both 3D-TOF-MRA and DSA at baseline. The demographic data, clinical manifestations, and main laboratory test results of the 31 enrolled patients are shown in Table 1. The other 54 patients were not included because they did not undergo both procedures before treatment (n = 21) or because of a lack of digitalized images to review (n = 33). These excluded patients had more headaches, cognitive impairment, and loss of consciousness than those enrolled. They were more often in the biopsy-proved PCNSV group, and their DSA and 3D-TOF-MRA findings were often less positive compared with included patients, though the differences were not statistically significant. Excluded and enrolled patients did not differ in terms of other demographic data, laboratory tests, neuroimaging results, treatment, and outcome. Sixteen (52%) of the 31 patients analyzed in this study had a brain biopsy that showed vasculitis features in 8 cases (50%). The 23 patients without histologic proof of vasculitis had DSA-diagnosed PCNSV and did not show any clinical or biologic signs compatible with another vessel-related disease, including RCVS, during a median follow-up of 43 months (range, 14–78 months). Brain MRIs with T1-weighted, T2-weighted, fluid-attenuated inversion recovery, T1-weighted with gadolinium injection, gradient-echo T2*-weighted, and diffusion-weighted imaging with apparent diffusion coefficient mapping as well as 3D-TOF-MRA sequences were obtained on 1.5T and 3T MR imaging units in 20 and 11 patients, respectively. Characteristics of each MR imaging unit and sequence parameters are shown in the On-line Table. Interrater concordance in identifying intracranial artery lesions on DSA and 3D-TOF-MRA was excellent (κ = 0.93; 95% CI, 0.89–0.96; and κ = 0.87; 95% CI, 0.79–0.92, respectively). Twenty-five (81%) patients had abnormal DSA findings, and 24 (77%) of them also had abnormal 3D-TOF-MRA findings (2 patients are presented in Figs 1 and 2). The patient with abnormal DSA findings but normal 3D-TOF-MRA findings had isolated small-vessel involvement, demonstrated by brain biopsy. The 6 patients with normal DSA findings (and normal 3D-TOF-MRA findings) had biopsy-proved PCNSV. 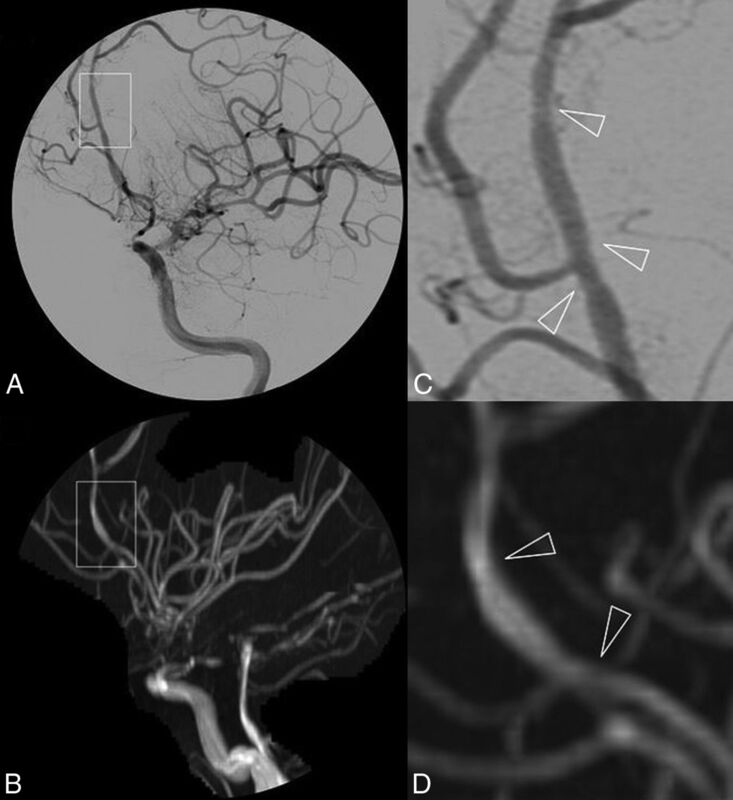 DSA (A) and 3D-TOF-MRA (C) with respective magnifications (B and D) of a patient with primary central nervous system vasculitis. A near-occlusive stenotic lesion of the proximal middle cerebral artery segment extending to both superficial branches with a pseudodilation of the bifurcation is shown. Arterial lumen irregularities are also observed in A2 segments of both anterior cerebral arteries. 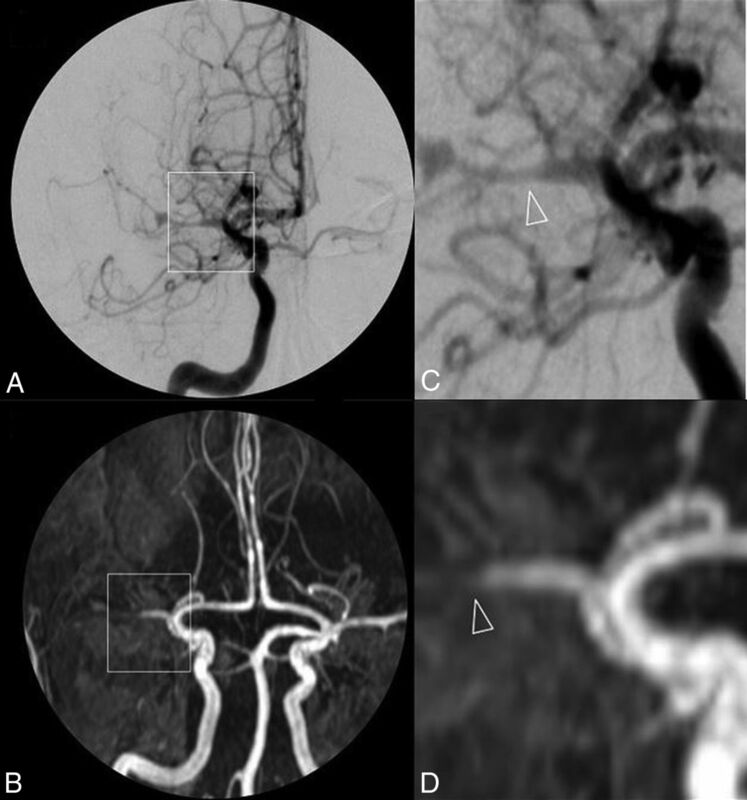 DSA (A) and 3D-TOF-MRA (C) with respective magnifications (B and D) of a patient with primary central nervous system vasculitis. Subtle irregularities of the arterial lumen of the A2–A3 segments of the left anterior cerebral artery are shown in a patient with otherwise near-occlusive stenoses of left intracranial internal carotid artery extending to the initial portion of the left MCA. In a per-segment analysis, medians of 2 (range, 0–18) and 3 (range, 0–18) abnormal segments were observed on 3D-TOF-MRA and DSA (P = .03), respectively. 3D-TOF-MRA identified 116 of 141 (82.3%) abnormal segments as observed on DSA. The other 25 false-negative segments observed only on DSA but not on 3D-TOF-MRA were small-sized vessels in 16 cases, medium-sized vessels in 8 cases, and large-sized vessels in 1 case. Seven false-positive vascular segments were involved in MRA but not on DSA: medium-sized vessels in 4 cases and small-sized vessels in 3. There was a high degree of concordance between 3D-TOF-MRA and DSA (κ Index, 0.84; 95% CI, 0.79–0.89; P < .0001). Concordance between 1.5T 3D-TOF-MRA and DSA was 0.82 (95% CI, 0.75–0.93), and between 3T 3D-TOF-MRA and DSA, it was 0.87 (95% CI, 0.78–0.91). Detailed κ indices for each vascular segment according to the MR imaging unit are shown in Table 2. All κ indices were >0.50, even for small-sized vessels. When we assessed small-vessel involvement, 3T 3D-TOF-MRA showed better results than 1.5T 3D-TOF-MRA. The sensitivity, specificity, diagnostic accuracy, and positive and negative predictive values of all MRAs, 1.5T MRAs, and 3T MRAs, with DSA as the criterion standard, are shown in Table 3. Our results indicate excellent concordance between noncontrast 3D-TOF-MRA and DSA in patients with PCNSV during the initial imaging work-up. For small-vessel involvement, 3T 3D-TOF-MRA detected more distal vascular involvement than 1.5T units. As expected, compared with 1.5T units, 3T 3D-TOF MRA showed better sensitivity and concordance with DSA. In small-sized vessel involvement, a high degree of concordance was observed between 3D-TOF-MRA and DSA only for 3T units. However, isolated small-sized vessel PCNSV involves a subgroup of patients in whom DSA findings (and a fortiori 3D-TOF-MRA) are also mostly negative, and only biopsy can show vascular involvement in these patients.9,20⇓–22 In our first description of the French cohort, as well as in another large study by Salvarani et al,23 two-thirds of the patients with biopsy-proved PCNSV had negative DSA findings.9 In the present study, 6 of our 7 patients with isolated small-sized vessel vasculitis demonstrated by biopsy had normal 3D-TOF-MRA and DSA findings. Hence, our results suggest that 3D-TOF-MRA could be performed as the first vascular imaging for patients with suspected PCNSV. When findings are negative, DSA could be the second imaging procedure, though our results showed that most patients would have negative DSA findings in this setting. This study has limitations, including its retrospective design and relatively small sample size. Moreover, because this was a multicenter study, 3D-TOF-MRA was not performed with similar parameters in each center. The heterogeneity of MR imaging devices used at different sites and the use of 1.5T or 3T MR imaging are limitations because differences in acquisition parameters may influence both image quality and diagnosis. However, the demonstration of a good concordance between 1.5/3T 3D-TOF-MRA and DSA among manufacturers and MR imaging fields strengthens the conclusion that 3D-TOF-MRA can be used to demonstrate the involvement of multiple vessels in the working diagnosis of PCNSV. Regarding the visibility of distal branches on 3D-TOF-MRA, the use of a multislab technique may have led to misinterpretation and false-positives for distal stenoses. However, distal stenoses observed on 3D-TOF-MRA were also observed on DSA, reducing the probability of false-positivity. Although the present study suggests that demonstration of multifocal segmental stenosis of cerebral arteries on 3D-TOF-MRA may be sufficient to strengthen the diagnostic suspicion of PCNSV, DSA may also be necessary to add precise lesional mapping in the distal vasculature and rule out mimics. Finally, we performed per-patient and per-segment analyses. In the latter, we may have artificially increased the diagnostic performance of MRA because readers classified each segment as normal or pathologic, irrespective of the number of focal stenoses. The present study adds new insights to the diagnostic approach for patients with suspected PCNSV. 3D-TOF-MRA showed excellent concordance with DSA in demonstrating multiple vascular lesions. Higher performance was observed in distal vascular analysis with 3T 3D-TOF-MRA than with 1.5T units. Additionally, in patients with negative 3D-TOF-MRA findings, particularly obtained on a 3T MR imaging unit, the DSA yield was low. Further studies are required to determine whether 3T 3D-TOF-MRA can replace DSA. The authors thank Dr Alison Johnson for proof-reading the manuscript. Disclosures: Emmanuel Touzé—UNRELATED: Board Membership: Boehringer Ingelheim; Payment for Lectures Including Service on Speakers Bureaus: Boehringer Ingelheim, Bristol-Myers Squibb, Amgen, Pfizer, Bayer; Travel/Accommodations/Meeting Expenses Unrelated to Activities Listed: Teva Pharmaceutical Industries, Sanofi Genzyme. Mathieu Zuber—UNRELATED: Board Membership: Boehringer Ingelheim; Consultancy: Boehringer Ingelheim, Bayer; Payment for Lectures Including Service on Speakers Bureaus: Boehringer Ingelheim, Bayer, Sanofi. Christian Pagnoux—UNRELATED: Board Membership: Roche, Sanofi, ChemoCentryx, Comments: Less than €15,000 each during the past 5 years; Consultancy: Roche, Sanofi, ChemoCentryx, Comments: board and consultancy included, less than €15,000 each during the past 5 years; Grants/Grants Pending: Roche, Comments: educational in-aid grant <15,000 CAD in past 3 years; Payment for Lectures Including Service on Speakers Bureaus: Roche, Comments: Less than 5000 CAD during the past 3 years. This study was supported by an institutional grant from the French Ministry of Health (COVAC, 2009 PHRC 08017). Accepted after revision May 20, 2017.